Will Ruth aka “Strength Coach Will” here from StrengthCoachWill.com, the Rowperfect e-book, “Rowing Stronger: Strength Training to Maximize Your Rowing Performance,” guest blogs here, and the Strength Coach Roundtable podcast on the Rowing Chat Network. 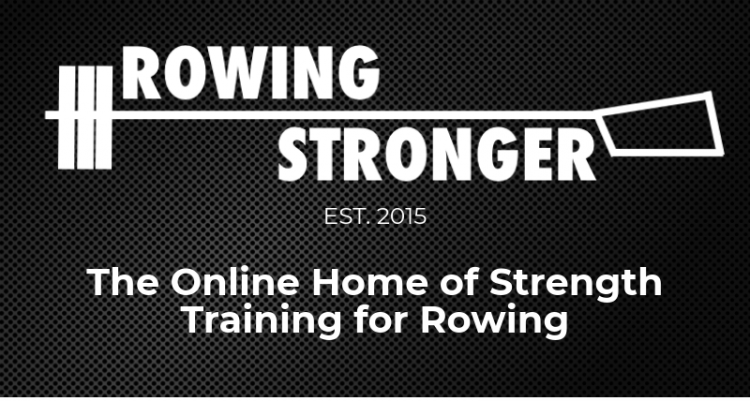 I’m writing to let you all know that I’ve moved all of my rowing content to my new website, RowingStronger.com. I started my original website in 2015 intending to provide resources just for my in-person athletes who wanted to put in extra effort outside of practice. I had explanations of my programs, the “Mobility for Rowers” series, cooking recipes, the Exercise Index, and a few other things available. It turned out there weren’t many people writing online about strength training for rowing in an accessible fashion, so my content started coming up on search engines, I found myself answering questions on social media, and I started working with Rowperfect later that year. I’ve written a lot, coached a lot, and learned a lot in the few years since then, and my old blog-style website became quite cumbersome and made content difficult to find as I added more and more resources for strength training for rowing. I spent most of 2017 tinkering with website design around my coaching, graduate program, and other projects, and finally rolled it out this month to start 2018 with a bang. The main thing I wanted to improve was the reader experience. The new site features bigger fonts and serif fonts for more comfortable reading, as well as much better system for organizing my 70+ articles. I’ve published a few new articles already and, with the new display, you might be able to find some older content you missed! Another thing I’ve been doing is going back through my old articles and updating them, as well as adding in some free mini e-books of my most popular article series. I’ve got a special offer for you as a Rowperfect reader so you don’t have to comb through every post. For a limited time, you can get all of these e-books available in one place as free PDFs at the link below. Finally, I’m excited to announce that I am working on revising and updating my “Rowing Stronger” e-book with the plan to publish it as a second version in summer of 2018. I’ve been thrilled at the popularity of the book since Rowperfect published it in October 2015, and I’m excited for the opportunity to update it with what I’ve learned since then, including more resources, more content, and sample programs. By popular demand, there will also be a hard copy version available as well! If you’d like to keep up with me and get on the list for book updates, the best way is to sign up for my email list. I write 2-4 times a month with updates on new articles, videos, or podcasts, as well as notes from my coaching and learning in school that don’t necessarily make it into an official blog post. You can sign up directly here, or any time via the subscriber box on my website. Thank you sincerely for your readership over these last few years, and I hope you’re as excited as I am for the years to come. I’ve had a fantastic time expanding my coaching to the online realm and have really enjoyed my part in the Rowperfect mission of being a global source for rowing education.